Game Preview: Barrie Colts vs Mississauga Steelheads. 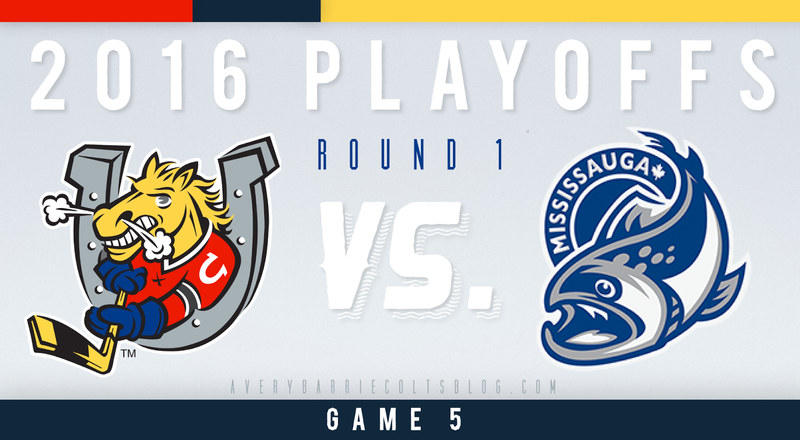 (Game 5) #OHL - Very Barrie Colts | A website covering the Barrie Colts of the OHL. Tonight is game 5 or the Eastern Conference Quarter Finals between the Barrie Colts and the Mississauga Steelheads. We are back in Barrie at BMC and tied 2-2. The Colts evened up the series this past Thursday night in Mississauga in an exciting 6-5 victory in overtime. There was a lot of good to take away from game 4, other than the obvious fact that they won. Barrie played a really strong game when they were not taking penalties. When you consider how much time they spend in the box, it is impressive that they managed to out shoot the Trout as much as they did. Also worth mentioning that the Colts only got one chance at the power play compared to 6 chances for the Steelheads. It was tough to tell when the refs were letting the guys play and when they were making calls but it seemed that the calls were going in the Trouts favour. That being said, the penalties the Colts took in most cases were REALLY BAD. And when you really look at the game it was really discipline that killed the team. 3 of the 5 Trout goals were on the man advantage. Majority of their good chances were up the extra man, and when they were even strength it seemed the Colts were able to control the play in all zones. If Barrie is able to stay disciplined this game there is no reason they can't dominate in game 5. So, how great was Justin Scott? Labanc and him were really playing great together and some of Kevin's set up passes were just beautiful. Guys like him, Mangiapane and Sadowy need to play physical but not get carried away and take bad penalties. Webster is doing a good job of getting under opponents skin but he is walking a line at times and has seen his share of time in the sin bin. Barrie needs to focus on its strength and that is not "shenanigans", it is skill. Over aggression is only hurting the team and it is not scaring the Trout at all. Rasmus Andersson continues to play great hockey for the Colts. A goal and two assists last game while ending the night with a +4. The team will really need him to keep playing at this level if then not only hope to get past round one but have any success beyond that. Blackwood or Ovsjannikov? Does it matter? I mean, yeah.. If Blackwood is still hurt at all, you don't play him. Colts took a "risk" many felt starting O in game 4 but at the end of the day, the team got the W. And it is tough to get upset about his allowing 5 goals against considering 3 of them were short handed. The first Nylander goal on him was just filthy. However, if Blackwood is healthy do you go back to him? I am willing to assume most of you are thinking yes. I think that is the right way to go, though with games going the way they have I honestly believe we have the same chance no matter who is in goal. End of the day, the team will decide how well the goalies will play and being disciplined will be the biggest deciding factor. Keys to Success: Discipline. Avoid scrums and just play the game. Mangiapane, Webster and Labanc are useless in the penalty box. If the team plays skilled, they will score, they will draw penalties and they will have a better chance of winning this series. Puck drop is scheduled at BMC for shortly after 7:30.